"Classic entrepreneurial broking at its best"
Dave Child, director of SIS Insurance, was unanimously voted winner of the prestigious “Specialist Risk Broker of the Year” award at the 2012 Insurance Times Awards, an event attended by over 1,500 guests celebrating achievement across the insurance industry. Dave was clearly delighted to receive such recognition as a provider of socially focused insurance products, for example motor, home and business insurance for bankrupts and insurance for people with criminal convictions. The judges unanimous decision in this category was down to the in-depth knowledge SIS and its employees hold for the social enterprise insurance and criminal convictions insurance industries. SIS not only provides these services but uses them on a daily basis. SIS are members of the EFFRR (Employers' Forum for Reducing Re-offending) and recently employed an ex-offender who is integrating into the team well. 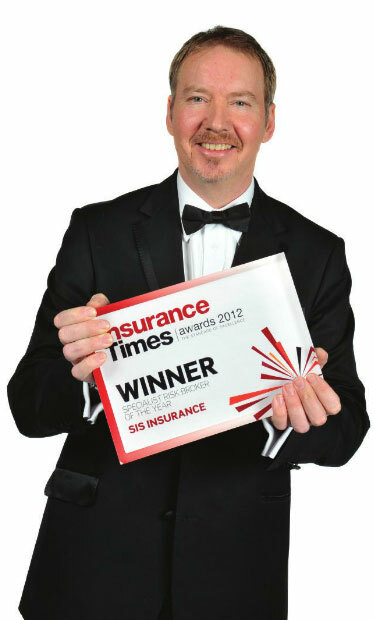 During the awards ceremony, the Insurance Times judges’ decision was also based on the exemplary manner in which SIS Insurance sought to understand and scale their business and insurance brokering services to suit each client, working in close partnership with insurance providers to achieve the best value insurance – both in terms of price and quality of insurance cover provided. Furthermore, SIS received recognition as an “outstanding example of how doing social good can generate real business value” stating that “this is classic entrepreneurial brokering at its best”. Contact SIS today for all your insurance needs. You can watch David Child collecting the Award for “Specialist Risk Broker of the Year” 2012 by clicking here.